Who pays to prevent drownings? 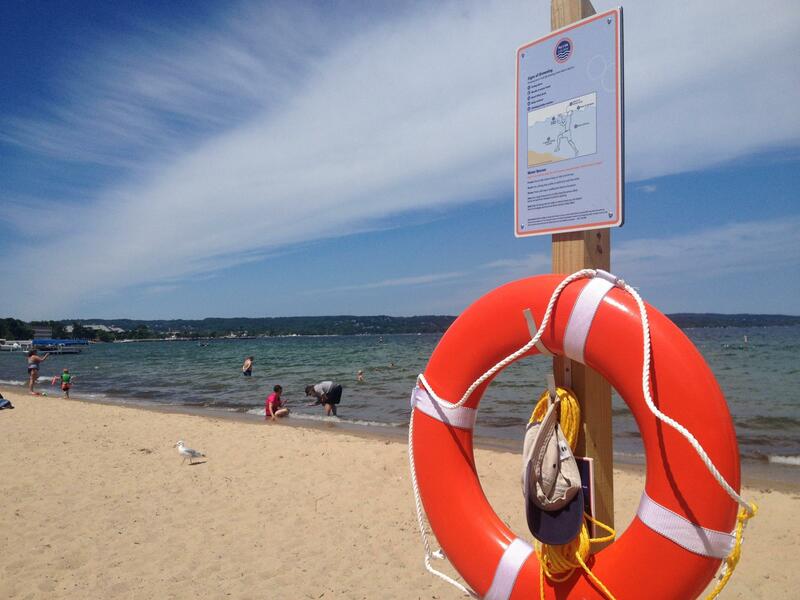 A sign at Bryant Park in Traverse City warns swimmers of drowning danger. Grand Traverse County may have to decide if water safety is their responsibility and worth the investment. Grand Traverse County could be forced to decide whether to spend $1 million to fix Easling Pool in the next year. Financial concerns about the only public pool in the area have sparked debate about whether water safety is the county’s responsibility. There are plenty of places to swim up north, but until recently school kids didn’t get any water safety training. Now the county might get out of that business. Swim lessons are offered year round at the county’s Easling Pool. The pool teaches roughly 650 people how to swim every year. Joshua Gooden is there because he wants his nine year-old son to learn to swim. “We’ve had quite a few drownings even just in the last few years with people who were said to be good strong swimmers," says Gooden. Gooden figures water safety is a big deal in northern Michigan. In fact, the Centers for Disease Control and Prevention ranks drowning as the second-leading cause of accidental deaths for children. Dave Benjamin, executive director of Great Lakes Surf Rescue Project, agrees with Gooden that water safety should be a top priority. He just doesn’t think it’s enough of a priority in schools yet. Benjamin’s project focuses on drownings in the Great Lakes, but lately it’s been inland lake drownings that have shifted the conversation toward water safety. It wasn’t until three drownings at Twin Lakes that water safety training finally entered area public schools. Now 9th graders in Traverse City get safety training. The county Parks and Recreation Department helped make that happen. Those water safety sessions have been held at Easling Pool, one of two pools in Grand Traverse County. It’s the only public pool, but not everyone thinks it’s a great public investment. Is the county responsible for water safety? Johnson says he was a member of the Coast Guard for years so he cares about water safety. But as a commissioner, he’s more concerned about the county’s deficit. “I’ve been consistently looking at what can we do to save some money in the county, and to me, with the deficit that was there, [Easling Pool] is an easy target,” he says. Right now, county staff are trying to figure out what it would cost to keep the pool open. Repairs and upgrades could cost upwards of $1 million. Johnson realizes the pool will probably never make money for the county, but he’d like to see the deficit decrease. Kristine Erickson, director of Parks and Recreation for the county, says closing Easling Pool isn’t a good option. She says the county needs more pools, not fewer. According to Great Lakes Surf Rescue Project, there have been 414 drowning deaths in the Great Lakes since 2010. Roughly half of those drownings happened in Lake Michigan. But Dave Benjamin says swim lessons alone won’t stop the problem. Benjamin’s organization wants all schools to teach students how to behave in drowning situations and how to assess risks in the water. And Traverse City public schools are providing something like that now for their 9th graders at Easling Pool. But if the county doesn’t want to make the necessary repairs on the pool, then that school program would have to go to the YMCA. The YMCA has said they can’t take on all of Easling Pool’s programming. It was a deadly weekend on the Great Lakes. Seven people drowned, including three in Lake Michigan. Kevin Schlake, 40, of Cincinnati, died Sunday after swimming at Peterson Beach, toward the southern end of the Sleeping Bear Dunes National Lakeshore. Schlake was caught in a rip current. The family says he was trying to rescue a 12-year-old nephew. Schlake’s brother-in-law was able to make it to shore after a struggle in strong surf. Also this weekend, a Chicago doctor drowned at St. Joseph beach while trying to rescue two children. Recent deaths from drowning in Grand Traverse County have put water safety in the high school curriculum. All freshmen in Traverse City schools will spend a few hours this year learning about the dangers of water. Such instruction is less common that you might think up north. If you grew up downstate, you might have taken swimming lessons at school and learned some of the basic safety mantras like, “reach or throw, don’t go” if a swimmer is in trouble. But few schools up north have swimming pools. Harbor Springs is a notable exception. There were 87 people who died by drowning last year in Great Lakes waters, according to numbers reported by the Great Lakes Surf Rescue Project. A significant number of swimmers were caught in rip currents. Project CEO Bob Pratt says safety experts are still learning about rip-current survival, but there's some evidence to suggest the best thing for a swimmer to do if caught in a rip current is to stop swimming.